Several of the top prep hoops prospects in the country will converge upon Albertus Magnus College in New Haven on Tuesday and Wednesday, March 8 and 9, for the National Prep Championships. 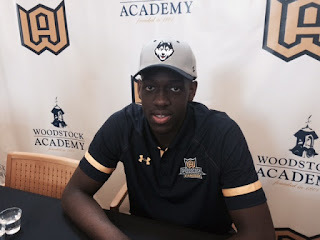 Of most interest to UConn fans is Putnam Science Academy, which faces DME Academy of Florida on Tuesday at 2:45 p.m. PSA features UConn commit Mamadou Diarra, along with Husky targets Hamidou Diallo and Eric Ayala. Diallo, a Class of 2017 swingman, is one of the most coveted prep targets in the country. DME is led by SMU commit Ted Kapita. UConn will be on-hand for that game and is expected to check out Tuesday's 11:15 a.m. bout between Florida's IMG Academy and Brewster Academy. Brewster features Alpha Diallo, a 6-7 small forward who the Huskies are keeping their eyes on. replica cartier watches, combining elegant style and cutting-edge technology, a variety of styles of replica cartier tank mc watches, the pointer walks between your exclusive taste style.